We are situated in Mundesley village centre opposite the shoppers car park. The seaside village of Mundesley is on the North Norfolk coast 7 miles down from Cromer. A very popular holiday destination with a lovely beach (and beach cafe) which is blue-flagged and is fantastic for families. We have a selection of silver jewellery made by local jeweller Victoria Martin. Each piece is handmade using swarovski crystals and freshwater pearls. Many of Victoria's pieces can be personalised with individual messages and quotations - perfect for a birthday or special gift. To compliment our range we have a selection of Italian leather handbags. They range from the cute little bucket bags pictured above to the little cross the body bags - great when you need a free hand. They come in a great range of colours so you are bound to find one to suit you! 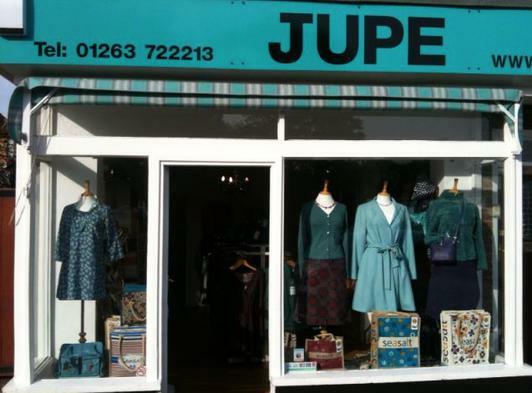 I am Amanda and I am the owner of Jupe. My family and I have lived in Mundesley for 10 years and together with our cats and chickens we are very much part of village life! I have always had a passion for clothes and shoes and love having a shop full of beautiful things! Of course it is essential that I wear things from the shop as much as possible (I tell my husband it is advertising)! We stock many labels including the English label Seasalt, Avoca from Ireland, another English label - Nancy Mac and a new Danish brand called Byoung. We are always looking for new designers so if you have any particular favourites do let us know.